This article is about the Jurassic World minifigure. For the Star Wars minifigure, see Owen Lars. 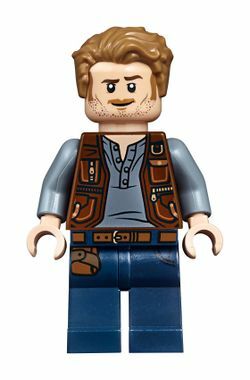 Owen Grady is a Jurassic World minifigure first released in 2015. Owen has light brown hair and facial hair. He is wearing dark gray pants,a light gray shirt, and a brown vest. He has a two-sided head. One side features an open mouth, where he is gritting his teeth. The other side features a closed mouth smirk. Owen Grady trains the Velociraptor pack at Jurassic World. He was critical in defeating the mutated dinosaur. In Jurassic World and its sequel "Fallen Kingdom", Owen is played by Chris Pratt, who also voiced Emmet in The LEGO Movie and played Star-Lord in Guardians of the Galaxy. This page was last edited on 25 February 2018, at 13:47.